In actuality, she has returned from last year. In the Spring of 2012, I was preparing to put some flowers in these hanging pots on my garage. 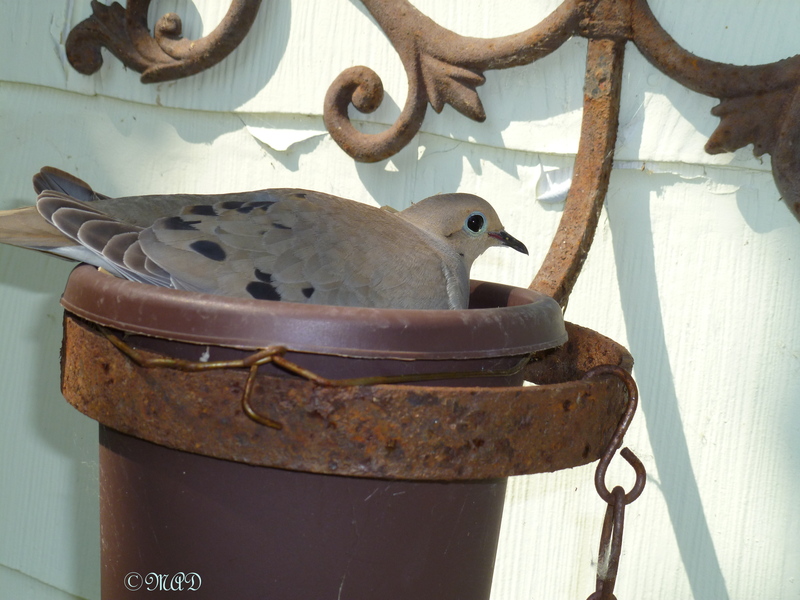 Imagine my surprise when I looked up and realized that a sweet dove had taken up residence in one of them. It’s an ideal spot to safely raise a brood. She eventually hatched out 2 little baby doves and soon trained them to fly and they were off and gone. While I’ve been digging in my veggie garden, in the afternoons and on Saturdays and Sundays, she has been providing sweet musical coo’s. Along with her coo’s, at precisely 7:15 p.m. every evening, there are 2 big owls who hoot to each other, one from the tree in front of my house and one from the tree behind my backyard. I still have not been able to actually see them. 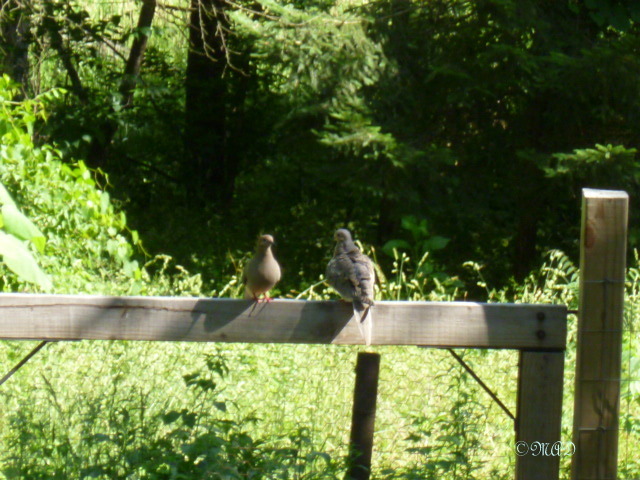 I hope they are not keeping a hungry eye on Mrs. Dove & her brood. I feel honored that Mrs. Dovey feels at home enough to sing to me. Update: Yesterday (23 May), her baby or babies hatched (I can’t see down into the pot to see how many there are). I tried to get a photo while she was feeding but I wasn’t quick enough. Will try again this afternoon! 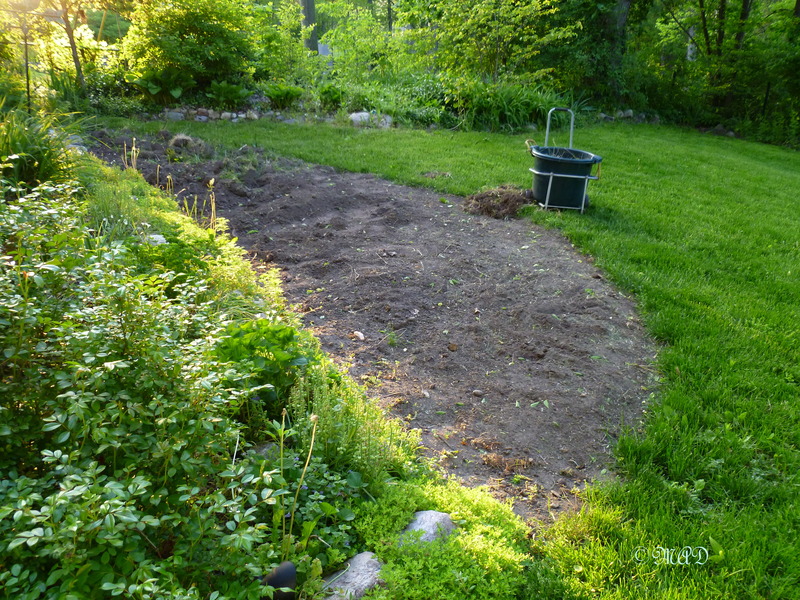 This entry was posted in Gardening and tagged Doves, little baby, Nest, Owls, veggie garden. Bookmark the permalink. Doves are so cute – there was one by my lunch table today at a nearby restaurant! Thanks for visiting my blog, too. Yes they are, such sweet birds. You’re welcome! Lovely post and “serene” photos! 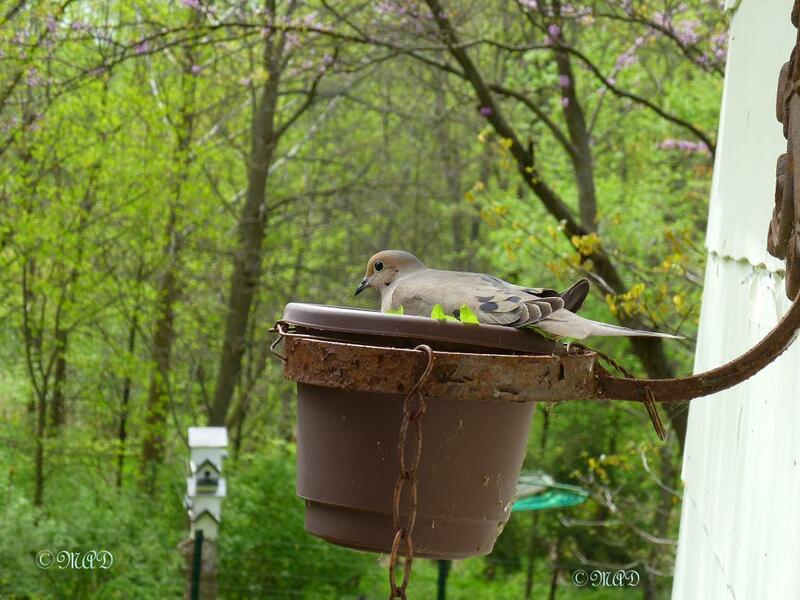 Doves are so sweet and it must be wonderful to have a whole family in your garden! Thanks! Yes it is, so good to see them return each year. Makes me feel like family.